Highlights include: Traffic congestion, classroom artwork, Room 11’s new teacher. Note: Term 2 starts Monday 5 May @ 9 am. We hope you enjoy safe and adventurous holidays, and we look forward to hearing lots of wonderful stories when we get back to school! 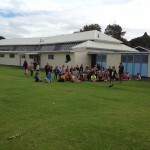 The Gumboot Throwing Competition got underway this week with the whanau group trials being held. Unfortunately the finals were postponed to next term due to the wet weather. Watch this space for the winners next term!